D.C. Bicycle Advisory Council: Now that Cabi has a core, what about the rest of us? Now that Cabi has a core, what about the rest of us? Finally, a photo by uno000 on Flickr. As Capital Bikeshare adds 5 new stations with 20 more on the way and the addition of thousands of new members in the last few weeks, it's time to start asking about what's next for the system, or more specifically, who's next? 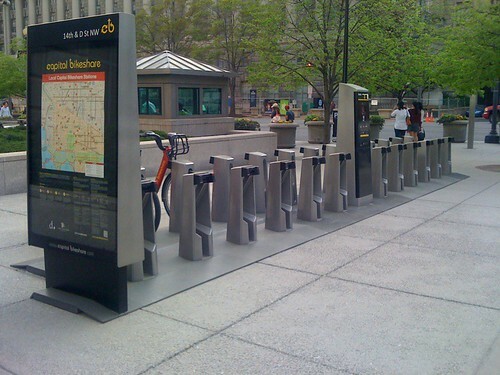 David Alpert asks "Where should 25 new Capital Bikeshare stations go? ", on Greater Greater Washington but more specifically, what about the rest of us? While the saturation in the core will help Cabi cement its self as a short distance transportation option, there are vast areas of the city that have few stations. One of the cost savings associated with Cabi is the ability to ride short distances without being charged if users return bikes to the destination location in 30 minutes or less. For many areas, especially those in the Wards 4 and 5, that's not much time. That same issue is evident for those who live in Wards 7 and 8 as they attempt to beat the clock to the next station the difference is that they have more current and planned stations in those Wards than in wards 4 and 5 and they are closer to each other, if only slightly. Currently, there appear to be few new stations planned for these areas as shown on the DDOT map Mr. Alpert displayed. This distance issue means that Cabi members in these areas could potentially pay more to use the system despite having a disproportionally larger number of lower income users. For the system to truly be widespread in the District (and to allow future connectivity to our Maryland neighbors to the north and east) and useful to more than just those in the core areas, more stations should be added outside of downtown and grouped in such a way that allows a reasonable amount of time to reach bike station points. This issue as well as other topics related to Cabi will likely be discussed at the next BAC meeting, Wednesday, May 4, 2011. Please join us and let us know where you think new stations should be added.